Inaugural Address for President Caroline Hazard, Wellesley College, October 1899 | The Albert M. Greenfield Digital Center for the History of Women's Education Full text available online. 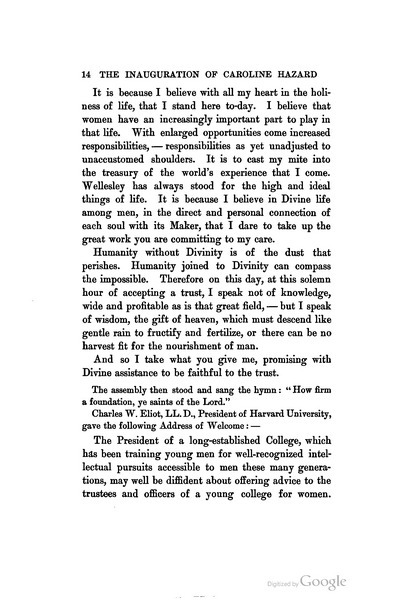 Address by Charles Eliot, President of Harvard, at the inauguration of President Caroline Hazard, Wellesley College, October 1899. Hazard, Caroline, and Wellesley College. A Record of the exercises attending the inauguration of Caroline Hazard, LITT. D., as president of Wellesley College, III October MDCCCXCIX. Cambridge: Riverside Press, 1899. Eliot, Charles, “Inaugural Address for President Caroline Hazard, Wellesley College, October 1899,” The Albert M. Greenfield Digital Center for the History of Women's Education, accessed April 20, 2019, http://greenfield.brynmawr.edu/items/show/1496.